Beef Jerky | Om nom nom! So we bought a dehydrator. Mostly to make jerky, because this is pretty much my favorite snack, and Shawn is a huge fan too. Added bonus that we can dry the extras from the hopefully prolific garden this summer. Anyway, I got the marinade from an old Alton Brown recipe, and followed it to the letter – it as awesome. Next time I might add more soy sauce and less red pepper flakes, but overall it was delicious! 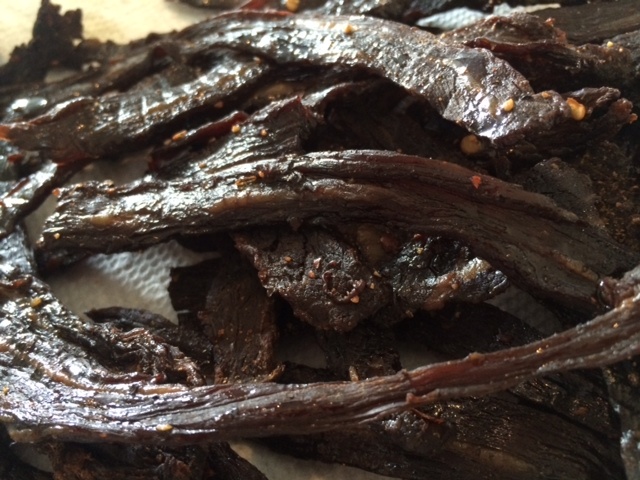 Our first attempt at jerky was a total winner. Freeze the meat 1-2 hours so it is easier to slice. Slice as thinly as you can! Marinate meat for 12+ hours. Drain and wipe excess marinade from meat before placing in a dehydrator (you can use a conventional oven for this, but I have not tried it). Dehydrate until firm, but won’t actually snap in half, 6-10 hours depending on how thinly you sliced the meat. Let cool, then wipe excess oil off. Store as air-tight as possible in a fridge or freezer.